As a Packt Cookbook, you can expect this book to be full of useful and practical recipes to common and important tasks faced by professional database administrators. This book is for Oracle Database, Middleware, System, and Infrastructure Administrators. 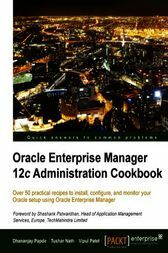 A basic understanding of Oracle Enterprise Manager is needed, as well as being comfortable using command line environments.